new low profile video card from AMD? I wanted to know if this year will see a new low profile video card from AMD? At the moment there are 2 graphics cards rx460 2gb-4gb lp and rx550 2gb-4gb lp, so I wanted to know if there will be more powerful solutions for LP adapters? For example, the same Navidia has 1050 ti lp which is more productive ..
AMD only manufactures the Graphics chip. They physical card (whether low profile or regular profile) is actually manufactured by our AIB partners (ASUS, Gigabyte, etc) so it's best you contact them for this information. The problem is heat. For a low profile you need a card that is around 75w or less, which is only the RX 460/560 from AMD. The 1050Ti is a good 36% faster than the RX 460 and 20% faster than the RX 560, so making a low profile version would not make much sense given the limited market appeal. Now, when the Vega is released AMD will start working on the Navi cards, but they have not said anything on their mid and low range cards as to if Vega will extend to the lower range or if there will be a tweak to the Polaris architecture for the RX 600 series. 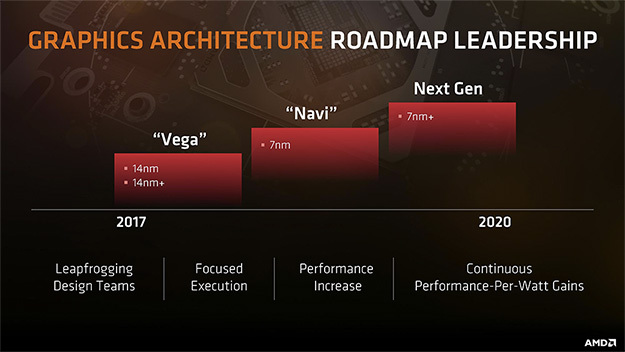 AMD says "leapfrogging design teams", so to me it sounds like AMD is adopting a sort of "tick-tock" system that Intel used for years, except in this case it's mid and low range, then top end, repeating every year. msi makes a RX 550 low profile card thats what i use. it has a dual fan too,and runs cooler then my previous gt 1030. this the only lp RX card.